THE GOOD - Powerful and humanistic performances from Ben Foster and newcomer Thomas Harcourt McKenzie. Debra Granik controls every moment of beauty within the frame. THE BAD - While some may consider it meditative and impactful, others will say it is slow and dull. ​​​​It has been far too long since "Winter's Bone." Writer/Director Debra Granik showed tremendous visual skill and a command over story and character which propelled that film to four Oscar nominations. While her follow up film (9 years after the last one) is not quite as exciting or likely to bring the same level of awards attention, "Leave No Trace" is a worthy follow up which reminds us of what a talent Granik truly is. Featuring a quiet and powerful performance from Ben Foster and a breakout performance from Thomasin Harcourt McKenzie (Much like Jennifer Lawrence was for "Winter's Bone"), "Leave No Trace" is "Captain Fantastic" done right. It's more grounded, less ridiculous and more compelling. 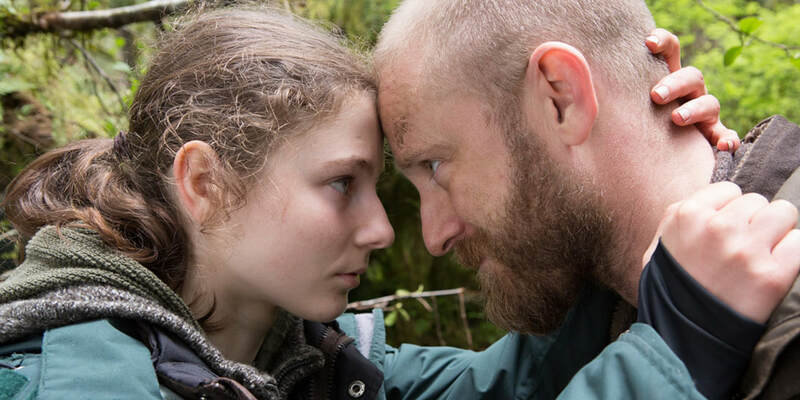 Will (Ben Foster) and his teenage daughter, Tom (Thomasin Harcourt McKenzie), have been living in the wilderness, isolated from civilization for an undisclosed amount of time. The reservation of Portland Oregon is where they call home, despite civilization deeming them homeless and trespassing. Trying to evade the law, the father and daughter are eventually placed into new surroundings, forcing them to come to grips with the reality of their situation and being forced to decide between a life of isolation or community. For years, I have been waiting for a leading role that is worthy of the talents of Ben Foster. A character actor at the beginning of his career, he has transformed into a fine supporting actor, constantly be singled out as the best or one of the best aspects of every film he is a part of. It's very exciting to see him finally lead a film but he is not the focal point of "Leave No Trace." That honor belongs to young Thomasin Harcourt McKenzie. The narrative is told through her eyes and she handles it incredibly well. Both her and Foster have a bond between them that feels real and so heartfelt that when a powerful moment comes towards the end of the film, it results in one of the most moving endings you're likely to see all year. "Leave No Trace" is not a thriller. Despite being on the run from the law and living in the wilderness, where every day is a fight for survival, the stakes never feel overly dramatic or forced. Granik's film is a silent one for long stretches of time and the combination of that quality with the beautiful woodland scenery creates a meditative and evocative approach. It's very easy to get lost in the beauty of not only the relationship between Tom and Will but also the land which surrounds them as well. Granik shoots every scene with an observant quality that never feels evasive. "Leave No Trace" is ultimately about two people, the bond which they share and the paths they are on. That special connection is the heart of the film and while a more exciting narrative would've been welcome, what we got is a powerful examination of family and one man's internal struggle to keep it together. Ben Foster and Thomasin Harcourt McKenzie (Remember her name) are both convincing and never lose our attention despite the film's slow pace and tranquillity. There will certainly be traces of this one imprinted on your mind once it is over.